Bengaluru has had staggering growth in the past decade and the city has been rising economically in every sector of the industry. However any developed city as it might be it always has had its own share of civic issues to handle. 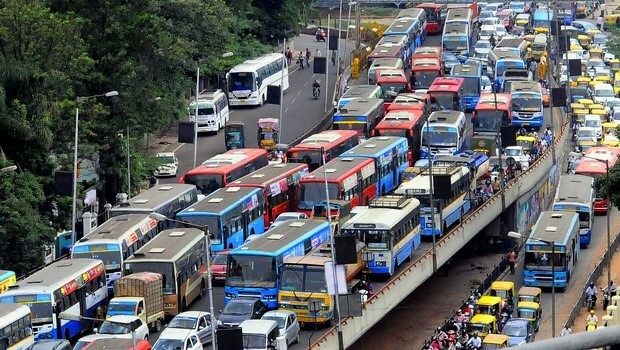 The number of vehicles plying the roads of Bengaluru has increased enormously with around 3000 to 4000 vehicles being registered everyday and with about 7 million vehicles in the city and thousands coming from outside the city, the traffic scenario in the city is not at all beautiful. The Metro rail development is still lagging behind and the public transport is only able to sustain only 40-50% of public commuting which add to the woes of the clogged city roads. Given the analysis from the past four decades the number of vehicles till the present day has grown at an unbelievable 6000% percentage. According to a survey by International Business Machines Corp. among 20 cities Bengaluru has the 6th worst traffic condition and is only next to Delhi in terms of poor parking capacity and facilities for vehicles. For people or tourists who do not know the back roads and are new in the city the travelling in and around the city is surely going to prove to be a major headache. One the major reasons though cannot be attributed to poor driving only but the mismanaged construction of intersections and U-turns with most important roads operating above its normal capacity and the average speed of vehicles has come down by 15 kms in peak hours. Leading e-commerce company Flipkart had taken initiative in spreading awareness through an event named ‘Gridlock Hackathon’ about the city’s bad traffic conditions and in finding solutions for it where numerous participants pitches ideas about how to come about with innovative schemes to handle the traffic congestion in the city. The traffic flows can be improved with eliminating uneven road widening, remove or demolish potholes, construction material, facilitate car parking and public vehicles, endeavor to keep animals away from roads, all lanes should be uniform in width, enforce queuing for right turns, additional direction indicators. But most prominently the resolution lies in strong and robust mechanism being implemented by the government after careful scrutiny of the present scenario with effective regulations and policies. Traffic utilization and advancement is imperative for decreasing pollution at traffic stop lights and for improving the travel time of the people moving in and around the city. A good and fast public transport with specifically allotted zones for parking and plying on the roads also aid in decongesting the clotting public roads of Bengaluru.